Dora Birthday Invitations - This Dora Party Invitation Idea Rocks! Are you making your own homemade birthday invitations for your darling little girl? If so you have come to the right place for some inspiration. 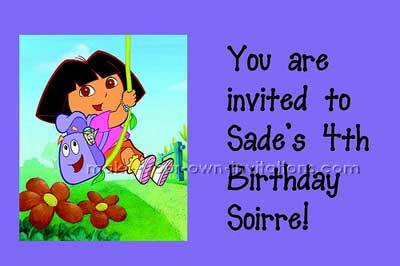 We have Dora the explorer party invitation samples from readers just like yourself who are in need of the perfect birthday invite. Take a look around our ever growing picture gallery for some great ideas. Invitation wording ideas can include: Where are we going? Jemma's Birthday Party, When are we going? The date, Where are we going? The address. Draw a map similar to Dora's map with the party destination at the end. Phrase it like Map does. I made these Dora invites in the same way that I made the Blues Clues Invitatons. Print off these free Dora the Explorer invitations. The pdf file contains 4 invitations per A4 sheet. Download the Dora invitations and print them on to card. Then simply fill out the rest of the party details.